Doncaster go into their final warm-up game against a young Leeds Rhinos side at the Keepmoat Stadium tomorrow still looking their first win. Player-coach Paul Cooke is demanding a much-improved display than last weekend’s 42-12 defeat against Hunslet Hawks. “A better performance than last week is paramount,” said Cooke. “I’m not too bothered about the result as I don’t think we won a pre-season game last year and we did okay. Prior to the game against Hunslet, Dons’ boss had said the squad for the club’s opening league game against London Broncos was beginning to take shape. Although not back to square one, Cooke admits the picture is now nowhere near as clear. 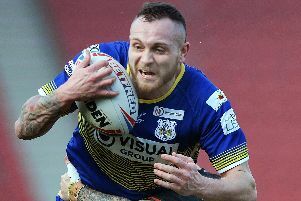 “The Hunslet game answered questions in a positive sense again about players who I feel have the right qualities to compete in the Championship as well as asking questions about others I thought were going well,” he said. Cooke is again unlikely to field any player carrying an injury, but plans to give the likes of Steve Snitch and Shaun Leaf, who missed the first two games, a good run-out. The Challenge Cup holders are expected to field a similar side to the one which beat Hunslet 28-14 a fortnight ago.